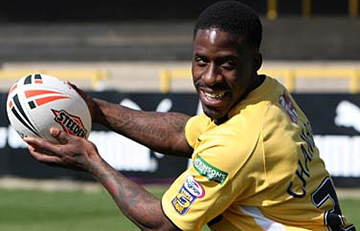 Olympic sprinter Dwain Chambers has signed an 18-month deal with the London Broncos. Chambers, 35, has dabbled with rugby league previously, having spent several months on trial with Castleford Tigers in 2008. Having made one reserve grade experience for the Tigers against York City Knights, Chambers was not retained by the club, but joins the Broncos who are the only club without a win so far in the 2014 campaign. It is hoped that with his athletic talent and raw speed, he can provide a cutting edge to the Broncos attack once he spends time developing his game in the reserve grade. Chambers is a double Olympian, having competed in Sydney in 2000 and London in 2012, and holds a personal best of 9.97 seconds for the 100m. He also currently holds the European 60m record. Prior to joing Castleford, Chambers had played American Football in NFL Europe with the now defunct Hamburg Sea Devils, so does bring some level of experience of contact sports to the London club. He was also at the centre of controversy in 2003 after receiveing a 2-year ban for drug offences in athletics, causing him to miss the Athens Olympics the following year.